Selamat Hari Raya Aidil Fitri, Maaf Zahir dan Batin. .......and still a fighter, and full of positive spirit. InsyaAllah Lely, you shall be back for Hari Raya with us in KL or Leicester next year, and we can 'pose' for more 'gambear' ( Peranakan for 'gambar') like this. Macik, apabila Iain cukup sihat, kita akan berjumpa lagi di Boon Lay untuk mendengar cerita lama Tanjung Keling dari Macik, InsyaAllah. Salam Hari Raya dan Maaf Zahir Batin dari cikgu maznoor dan Iain. On the 14th of August 2011, Singapore's Prime Minister Lee Hsien Loong made a speech in Malay for the Island Republic's "saudara-saudari sekalian" where, amongst other exaltations of Singapore's progress, LKY"s PM son mentioned this: "another reason the Malay community's perspective has become more national is because Malays have shared in Singapore's progress". When has the Singapore Malay ever been less 'national' ? What do you have to do and say (or not to do and not to say) to be regarded as being more 'national'. This begs the question "What are the attributes of being 'more national" ? Also there's a lot of difference between 'sharing' in and 'contributing' to Singapore's progress. Anyway in this National Day Speech the PM made this important announcement. Item 12. Another issue that concerns the Malay community is preserving its heritage in the midst of rapid development. Right now during Ramadan, Geylang Serai bustles with the Hari Raya bazaar. The community has strong emotional attachment to Geylang. 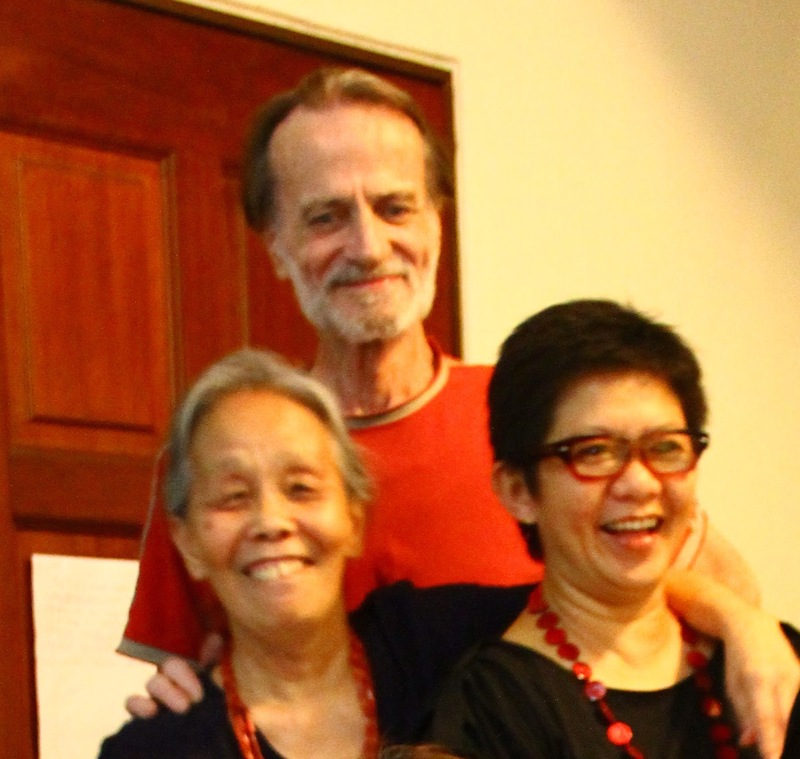 The older ones may have lived and played there, and have many precious memories of the kampung spirit. As the Malay proverb says: One remembers fondly one's childhood home. Item 13: There is presently a "Malay Village" in Geylang. Its lease expires soon. The Government plans to develop a new civic centre and plaza on part of the current site. The working name for the centre is Wisma Geylang Serai. It will house Geylang Serai CC and a heritage gallery to remind us of the old Geylang Serai. As for the Malay Village - its demise will not be mourned. It has become a 'brown' elephant or as the Malay proverb puts it : "Hidup Segan, Mati ta'Mahu". And so a campaign was set up to promote and publicise this Wisma Geylang Serai (WGS) concept among the populace. What else but a competition? A website "Name it! Name the upcoming civic centre in Geylang Serai" was set up to publicise this endeavour. ...Dr Maliki Osman's (Mayor of South East District and Chairman of the Civic Centre Workgroup) speech to Parliament on 17 October 2011, he said "Through the competition, apart from engendering ownership within the community, I hope we can find an original and creative name which reflects the Malay heritage, the nature and flavour of the civic centre, and can connect with the Malay community, the area's residents and the general public. Everyone has a part to play in this centre. Right from the beginning with finding a suitable name, we want to reach out and involve as many people as possible in this important chapter of Geylang Serai and Singapore's heritage,"
In http://www.namegeylangserai.sg/voting a number of names were submitted, such as Hab Warisan Geylang Serai, Kampung Geylang Serai, Mutiara Geylang Serai, Wisma Gemilang Geylang Serai, Pusat Sivik Geylang Serai. and many others. And the website heartily announced "Stay tuned for the final results and the lucky draw winners soon!" And on 4 April 2012 - the lucky winner was announced. Ladies and Gentlemen, - the winning name is .... wait for it ....... Wisma Geylang Serai !!! Hmmmhh ..... Sir/Madam, please forgive me for being so 'blur one' or BLF - wasn't that the name given by Prime Minister Lee Hsien Loong in his National Day Speech 2011? Sorry, what did you say? Oh.... a proper competition was set up and 'the name was finalised by a panel chaired by former Member of Parliament Yatiman Yusof ....... as well as the results of the online public voting in February 2012." "WISMA is a caption most people would attach to a Shopping Centre. Here's a random sample of the various connotations of WISMA. 1. A Shopping Mall. In Singapore there's a well-established Wisma Atria at Orchard Road, a swanky, pricey shopping hotspot for young female wannabes with loadsofmoney. 2. On a higher plane, there's Wisma Putra, the Malaysian Ministry of Foreign Affairs. 3. There's also the sports Wisma-FAM, the headquarters of the Football Association of Malaysia. 4. In Indonesia, strangely enough, Wisma refers mainly to a guest house or a hotel - for example the Wisma Cinta Alam in Sumatra. Which one of the above can be associated with Wisma Geylang Serai? I dare not hazard a guess. But most certainly, heritage does not come into the picture at all even though the 'Malay Heritage Centre' is inserted into this Mall - like an after-thought to glorify what is basically a glamourous Community Centre and Malay Mall. It will stand out like a carbuncle in this mega-Malay Wisma! All in all, it smacks of "Fine words butter no parsnips" or what we Malays describe as "Lebih indah kata daripada rupa". I do hope that this has nothing to do with the attribute of Wisma as a 'guest-house' - which transmogrifies Malays in Singapore into temporary, paying guests!!! The Chinese have Chinatown, the Indians have Little India. Can the Malays call Geylang "Malay Town" or "Little Nusantara" instead? As for a Malay Heritage Centre - that will have to be a completely different project. The heritage of Singapore Malays is located not only in Geylang or Arab Street , but also other sites on the Singapore River, Telok Blangah, Keppel Harbour, Pasir Panjang, Pulau Samulun, Pulau Merlimau, Pulau Ayer Chawan. Pulau Sudong and Semakau and many other Southern Islands." In seven year's time, in 2019, Singapore will be celebrating her 200th Anniversary. Those who are concerned about Malay Heritage in Singapore have a lot of thinking and delving to do like commemorating and marking the location of the Temenggong's House near the present Singapore Cricket Club, where in Telok Blangah the Temenggong was shunted in 1823 and why. Also it might be worth designing a map (has to be interactive in this age) of all these locations. I also reckon there should be included details such as how initially, only a strip of land about 5 miles in length, stretching from Mount Palmer to Tanjong Katong were ceded to the British. Not to be forgotten is the story behind the 'creation' of Pulau Jurong. That Pulau Semakau, the birthplace and home of my Sekolah Menengah Yusof Ishak students was turned into a landfill would make a nice drama, like the tales of the early migrants from China. There are loads more to be investigated. Singapore Malays have to write their own script of their place in modern Singapore. They have seven years to get it going and get it right. Good hunting and good luck from the little old lady." 1. Ben-Ari, an orthodox Jew and an Israeli lawmaker tore up the Bible and 'then posed for photographs' with the dismembered Holy Book (July 18 2012). The reason? The copy of the New Testament was mailed to him by Christian missionaries. Ben-Ari stated millions of Jews were slaughtered in the name of the Bible. "Many Christians over the centuries persecuted Jews, holding them responsible for Jesus' crucifixion." 2. An American brewery company had to apologise for naming beer after the Hindu Goddess Kali (May 15 2012). 'Kali-ma', a wheat ale spiced with cardamon, fenugreek, cumin and peppers had the picture of the Goddess with four arms and three severed heads on the label. "The demand was made in Rajya Sabha that US Ambassador to India should be summoned and asked to apologize for it." 3. In the picturesque town of Newquay in Cornwall, the Newquay Safe Partnership ran a "No Nonsense" campaign (July 2011) to ensure an improvement in the town's atmosphere. With the aid of the Police they took a tough approach to offensive T-shirts, sexually explicit antics and under-age drinking. 433 cans and bottles of alcohol (mostly bought by the parents of under-age teenagers) were seized. "Five 16-year-old girls were sent home to their families in Bristol after being found drunk." "Newquay welcomes everyone who behaves considerately and respects our world-class seaside resort, our residents and other visitors." Well said. Put it right there, mate!! WARNING : This link shows a picture which readers may find offensive: of the popular British comedian Baron Sacha Cohen - who capitalizes on mocking and vulgarizing foreign culture as his comic repertore - in a mankini. 4. To add grist to the mill, here's well-known British actress Joanna Lumley criticizing the dressing of young British women (15 July 2012) . "A lot of people have started to dress like lap dancers ...... that they should follow the example of the Duchess of Cambridge (Prince William's wife) - who always looks beautiful, graceful and elegant." Better you saying that Miss Lumley than we Muslim women. However I would dare her to say that to a group of women in a working-class pub in Middlesborough! Talking of women and garments. In April 2004, after a protest by Buddhists, a bikini lined with images of the Buddha was taken off the market without a whimper by the American retailer 'Victoria's Secret". Remember the furore when Muslims complained about the display of the Prophet's image? Isn't it nice to know that we are not alone in our sense of sensitivities? 5. "Jesus loves nukes": US Air Force taught the Christian Just War Theory" - in an article in The Telegraph (4 August 2011). At Vandenburg Air Force Base, for 20 years, this was taught by the Chaplains. Instructors quoted St. Augustine's just cause for war, telling them it was right "to avenge or to avert evil, to protect the innocent and restore moral and social order." They also recounted how, in the Book of Genesis, Abraham had organized an army to rescue Lot, and how there were "Old Testament believers who engaged war in a righteous way." Officers were also told that in (the Book of ) Judges, God is "motivating judges to fight and deliver Israel from foreign oppressors," and that there was "no pacifistic sentiment in mainstream Jewish history"
In the New Testament, they were told, Jesus used the Roman centurion as a "positive illustration of faith." One slide read: "Revelation 19:11 Jesus Christ is the mighty warrior." The course literature also quoted Werner von Braun, the leading German rocket scientist who went to work for the United States after the Second World War, saying that it was a 'moral' decision to surrender his technology to the US. However bits of the content of this seemingly critical article need to be scrutinised for 'accuracy'. Braun was not just concerned with the 'moral ' order- which in itself seems so praiseworthy. This is actually what he said : "we felt that only by surrendering such a weapon to people who are guided by the Bible could ..... an assurance to the world be best secured." I suppose this is why Iran's nuclear ambition has to be neutered or bombed to bits. The Course at Vanderburg Air Force Base was 'outed' and stopped - but it was like locking the stable door after the Christian Fundamentalist Horses had bolted. Now, what do these American Centurions get up to in their War for the Moral Order? On 6 July 2012 we learn of a video that 'appears' (the liberal Guardian are always cagey about attributing culpability to western atrocities in the Middle East) "to show a US Helicopter crew singing 'Bye-bye Miss American Pie' before blasting a group of Afghan men with a Hellfire missile. The footage comes in the wake of a string of 'damaging'' (another coy word) videos and pictures showing US forces urinating on the bodies of dead insurgents, and posing with the remains of suicide bombers and civilians killed for sport by a group of 'rogue' ( another white-wash word) soldiers." The Muslim Rohingyas in Burma have been at the receiving end of a campaign led by Buddhist monks where people are told not to associate themselves with this 'cruel by nature' community who are devising plans to 'exterminate other ethnic' groups. But this demonisation of the Rohingyas is not something new. 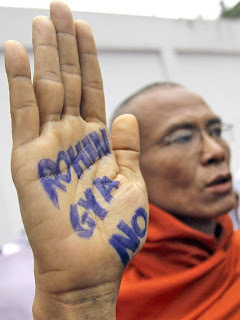 The Rohingyas, who have lived in Burma for centuries have been victims of persecution by the military junta for years. In 1982 they were stripped of their citizenship by the military government and they suffered the 'real' diaspora of seeking shelter in Bangla Desh and in Malaysia when their presence was greatly noticed in the mid-1980s. Note the Independent's choice of the word 'shunned'. It's rather a fluffy word to apply in this context where the tactic of the monks is to deny humanitarian assistance to the Rohingyas in overcrowded refugee camps. Their motives are no different from that of the Government's policy to 'segregate and expel the 800,000 minority'. This is not 'shunning'. This is 'persecuting'! Perhaps the western media have a large store of affection for Buddhist monks who have been at the forefront of the campaign for democracy in Burma and Tibet. And of course the smiling and jovial visage of the Dalai Lama contributes to this inability to call a spade a spade. As for The Lady Aung San Suu Kyi, I'm reading for the first time a criticism of her for failing to speak out for the 'human rights' of the Rohingyas. What if all the above took place in a Muslim country or were perpetrated by the followers of Islam? That's really a rhetorical question because bad news about 'bad' Muslims is common fodder for the print and electronic media. Now and then though, in the nooks and crannies of the media I manage to find fragments which give a wider perspective. However, even such news located in the mainstream media has to be picked over carefully especially in their choice of verbs and adjectives and also in the slant of the content.